Click here to read more of this story from The Age. Why I love Changi airport: simply because I can get my luggage trolley into the loo – a bonus for solo travellers with no mate to stand guard. The beauty of stopping in transit in countries as tiny as Singapore is that you’re smack in the city in the flutter of a fake eyelash; it’s just half an hour from the airport to whatever nirvana you’re looking for: theme park junkies head to Universal Studios, nostalgia buffs grab Singapore Slings at Raffles Hotel and label freaks gravitate to Orchard Road. Want a bowl of steaming laksa? Head to Katong, where a battalion of Nonyas (Malay mammas) fight it out in a long-standing battle for the best laksa in town. 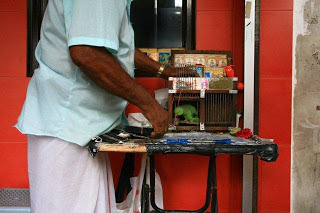 There are mosques for Muslims and boutiques for Indo-fashionistas in Kampong Glam and in chaotic Little India, I watch an old fortune teller use a green parrot to pull numbers from a deck of cards. It’s $S5 ($3.80) a number for a series that might win you the lottery. 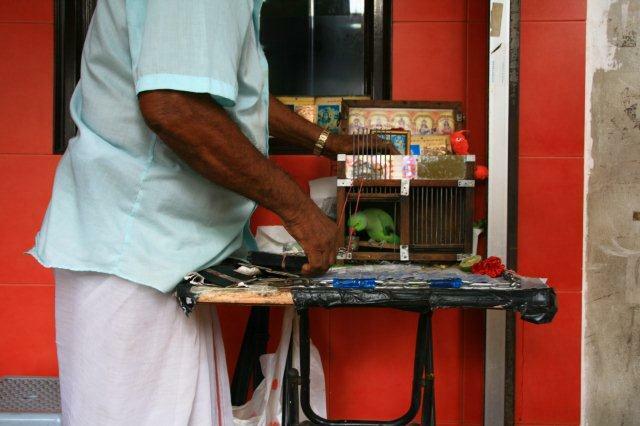 The parrot is working like a demon as punters stop by the little table on the footpath to try their luck. In the waterside bar quarter of Clark Quay, tiny Singaporean princesses totter into Shanghai Dolly, a Mando-pop bar. We say: avoid if you’ve just staggered off a long-haul flight with shiny skin and less-than-luscious locks. Singapore caters to all comers. And come they do, to a country masquerading as one of the world’s great transit lounges, open 24/7/365. Flight time About 8hr from Melbourne and Sydney. Who stops over? Singapore Airlines, Qantas, British Airways, Jetstar and Emirates are among the major airlines to go there. Taxi from airport to city Metered taxis from $S18 ($14), double from midnight to 6am plus a surcharge of $S3 to $S5. The journey takes about 30 minutes. Singapore Airlines has a free service between the airport, city centre and Sentosa Island for transit passengers, from $S6 for Singapore Airlines/SilkAir passengers and $S12 for others. See siahopon.com. Where to stay The Crowne Plaza Changi Airport is linked to the airport terminals via walkways and people movers, from $S320. See cpchangiairport.com. The Ambassador Transit Hotel in the airport’s transit lounge (therefore no need to clear immigration) sells rooms in six-hour blocks from $S76/double or has single-person rooms with shared bathrooms from $S41. See athmg.com. Visa Not required for Australian passport holders for a stay of up to 30 days. Just as well they were retired, as I don’t buy that line that people say they’ll continue to work. Yeah, right! Like I’m going to keep slogging it out for some bogan boss who can’t believe I still turn up at 9am every single day. I don’t buy that line that money won’t change us. Hell yes. Change me, baby. Change me. Bring on the vintage champagne and pool boy, I say. Sort of like that Imperial Leather ad doing the rounds at the moment. That’s my style..
Back to Le Traiteur, it’s deliciously French with an Aussie twist, with gorgeous mustards, relishes, lots and lots of porky things and now I know where I’ll buy my next lot of saffron from. I was willingly led there by G, who knows her onions, pates, terrines and brioches. I was uncharacteristically early, so watched the legals around me scoff the last remaining pies de jour (a sensational looking chicken and leek). Dammit, I wanted to rip the pies from their very plates. But I desisted, instead taking G’s recommendation for a brioche so buttery it should carry a health warning. The service: charming (hey, they welcomed a pram into the cafe during the lunchtime rush and owner Nick came out for a baby cuddle). The coffee: fabulous. Stick your nose in; trust me you won’t regret it.